There are many different methods for customizing a model and each Artist has their specialty. 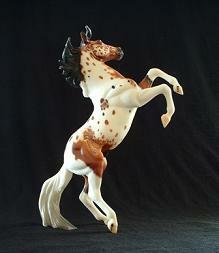 Some Customizers do a wonderful job of "etching" a model creating a breyer custom "etchie" such as the one in the pictures here. 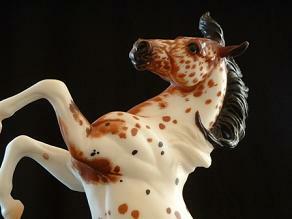 This model started out as a Bay Tobiano Silver Breyer model from the Treasure Hunt series and was etched into a beautiful Pintaloosa with added black spots by Gail Aspinwall. The goal of all customizing is realism and attention to detail. With etching, the paint is removed from the model to create a pattern. The methods vary with artists on how to remove the paint, but the most commonly known is by using an exacto knife or other sharp tool for paint removal and pattern design. (This method can be dangerous if not done carefully and properly.) Also the effects of the finished product will be different with each method used. In each method used the attempt is to create the natural hair pattern found on a real horse. Thus a roan colored horse that is etched will take a great deal of time to create because each hair is designed individually. 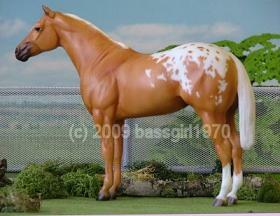 The following photos are of a custom etched Palomino Lady Phase done by Belinda Kranz.